Produces even better results in your research on killing unwanted microbes. Attract beneficial Tachyon Energy from the atmosphere! The Beads are only one of the major breakthroughs of the Takionic concept. These tiny mediators are mysteriously attractive with their silent message of harmony. Many people ask how I am able to maintain my demanding schedule and continually keep high, vibrant energy and excellent health. In my spiritual work, I have been guided to select products that keep me balanced, protect my immune system, and shield me from unhealthy electro-magnetic fields. I maintain excellent health because of the complete health and nutritional program I started years ago that I swear by. Following are the products I use that keep me healthy and vibrantly glowing! Daily doses of 70 essential and trace colloidal vitamins and minerals from Gold Shield Elite (plus other nutritional supplements). Weekly LightWaveZ technology applications to my face and body. Periodic 'tune-ups' and reharmonizations with the BCX ULTRA Technology and INDIGO or EPFX-SCIO Biofeedback technologies. The use of Biomagnetic Tabs in my home and office. Daily wearing of Tachyon Products. These are the finest products on the market today and some are also the least expensive I have seen! Hover and click on some of the items above to learn more. 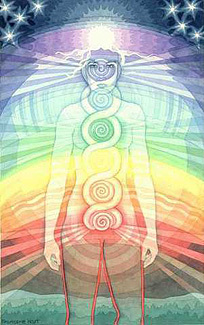 Over the past two decades, vibrational medicine has been a huge part of my life. I have used and I strongly recommend the BCX Ultra Technology. It literally saved my life every time I contracted a disease or “inconvenience”. I believe every home needs to have one of these machines, to safeguard health and help take charge of our destinies. In the last 8 years I have also used the top-of-the-line INDIGO or EPFX-SCIO Biofeedback device. This technology is truly remarkable! It reharmonizes just about everything that can go wrong with our bodies, and it accomplishes this with a simple “click” of the mouse. Acupuncture, chiropractic, pathogens, blood treatments, auric cleansing, NLP, entity clearings, allergies, vibrational nutrition, etc., it's all there. You name it, and it can be done with this futuristic marvel. To learn more about these amazing, state-of-the-art technologies, use the links on this website. If you wish to own these fabulous machines, call or send us an email. For some, you can even become a customer and buy at wholesale prices! Takionic Products must be purchased through Athena Leadership Center. Our goal is great health and vibrant energy -- to maintain our life force for the millennium! Let these products help you reach that goal. They work for me and I believe they will for you too. Disclaimer: These products or any of the other services offered on this website are not intended as substitutes for the medical advice of physicians or other health-care providers. Rather they are intended to offer complementary services to help participants in their quests for optimum health, wholeness & well-being. “Knowledge is Power Excellent health is a must! The Light Workers need to be informed on how to keep their bodies youthful, flexible, vibrant, and disease free.